Treat yourself to a day of pickerel fishing on Johnston Lake. The lake is known for it’s pickerel (walleye) population and as with most northern lakes you will find a few northern pike in there too. The campsite we use is set up for four guests with two boats & motors so you may bring up to 3 of your favourite friends/family to share a special day of self-guided fly-in fishing. The site is located approximately 61 km (38 sm) North of Yellowknife (63° 00.43’N/114° 10.57’W). Johnston Lake is about 6 km (3.7 sm) long, 1.5 km (1 sm) wide and is a relatively shallow lake. We encourage our guests to be at the Ahmic Air dock for 7:30am to get organized for the day and to facilitate an 8:00am departure. Make sure you have your fishing licenses the night before! 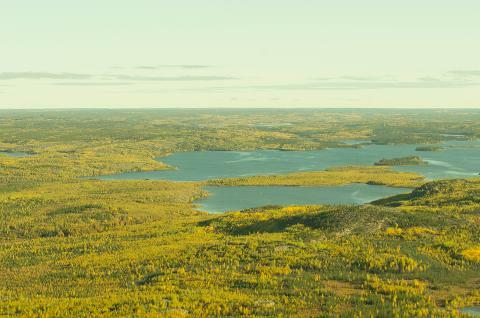 The flight to Johnston Lake from Yellowknife will be approximately 25 minutes in length. Prior to landing your pilot will give you a good review of the lake so that you have the opportunity to scout out the lake for shoals and underwater structure from the air.